Few people would disagree that hunger and malnutrition are the worst manifestations of poverty. Despite an overabundance of food in the world, severe malnutrition continues to exist, particularly in South Asia and Africa. Faced with this situation, many countries have adopted some sort of public food subsidy and/or public food distribution system. Common forms of programs include ration shops, food stamps, food for work, community kitchens and nutrition supplements. While these systems can be effective in reducing hunger and poverty, they are programs that can be severely compromised by corruption. 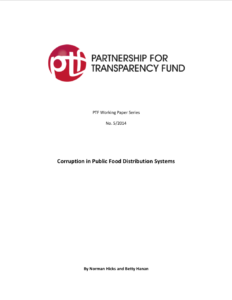 PTF has been active in supporting and helping CSOs with programs designed to reduce corruption in PDS (Public Food Distribution Systems). Since 2009, it has financed eight projects with grants totaling $202,000, for projects operated by 4 CSOs (civil society organizations). All of these projects have been in India. Most projects report success in raising citizen awareness, promoting collective action, reducing corruption, and improving the operations of PDS facilities to insure fuller access to entitlements. A number of lessons learned from these projects are drawn out and recommendations for future action are provided.